Broth-based soups are low-energy-density foods that are usually high in water and fiber and low in fat. These types of soup will fill you up with fewer calories and are healthier alternatives than cream-based soups. Eating low-calorie soup is an effective way to drop weight, but the American Heart Association recommends keeping your diet well-rounded by also eating fruits, vegetables, lean proteins and complex carbohydrates. Many chili recipes call for ingredients that are high in fat and calories, such as beef. Using a few different types of beans and leaving out the meat can cut your calories from 500 to 300 per serving and still provide you with a hearty, high-protein meal. 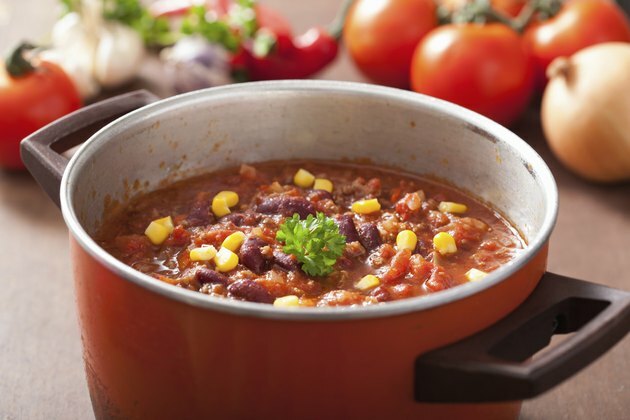 Make a three-bean chili by combining cannellini or red kidney beans, black beans and Anasazi beans with green, red and yellow bell pepper, onion, garlic and spices for a filling, warm, low-calorie soup. Chicken soup is a broth-based favorite, but most canned chicken soups are high in sodium, fat and calories. Make a homemade chicken noodle with lentils and barley for a soup that is high in protein and fiber and low in sodium and calories but loaded with classic chicken soup flavor. This soup combines brown lentils, olive oil, leeks, green bell pepper, garlic, chicken, carrots, barley, tomato and spices for a low-calorie, filling soup. According to Pennsylvania State University, people who eat broth-based soups, such as vegetable soup, are more successful in losing weight than those who eat the same amount of calories in snack foods. Put a twist on traditional veggie soup with nontraditional ingredients such as asparagus, summer squash, peas, cannellini beans and mushroom stock.